Images of beautiful galaxies, and in particular of spiral brethren of our own Milky Way, leaves no-one unmoved. It is difficult indeed to resist the charm of these impressive grand structures. Astronomers at Paranal Observatory used the versatile VIMOS instrument on the Very Large Telescope to photograph two magnificent examples of such "island universes", both of which are seen in a southern constellation with an animal name. But more significantly, both galaxies harboured a particular type of supernova, the explosion of a massive star during a late and fatal evolutionary stage. The above image is of the impressive spiral galaxy NGC 6118, located near the celestial equator, in the constellation Serpens (The Snake). It is a comparatively faint object of 13th magnitude with a rather low surface brightness, making it pretty hard to see in small telescopes. This shyness has prompted amateur astronomers to nickname NGC 6118 the "Blinking Galaxy" as it would appear to flick into existence when viewed through their telescopes in a certain orientation, and then suddenly disappear again as the eye position shifted. There is of course no such problem for the VLT's enormous light-collecting power and ability to produce sharp images, and this magnificent galaxy is here seen in unequalled detail. The colour photo is based on a series of exposures behind different optical filters, obtained with the VIMOS multi-mode instrument on the 8.2-m VLT Melipal telescope during several nights around August 21, 2004. About 80 million light-years away, NGC 6118 is a grand-design spiral seen at an angle, with a very small central bar and several rather tightly wound spiral arms (it is classified as of type "SA(s)cd") in which large numbers of bright bluish knots are visible. Most of them are active star-forming regions and in some, very luminous and young stars can be perceived. 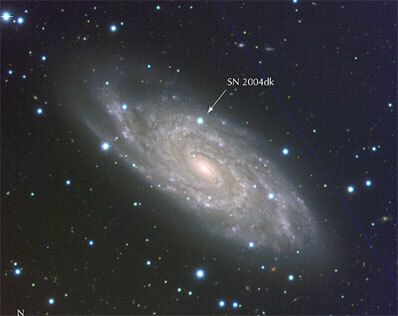 Of particular interest is the comparatively bright stellar-like object situated directly North of the galaxy's centre, near the periphery (see PR Photo 33b/04): it is Supernova 2004dk that was first reported on August 1, 2004. Observations a few days later showed this to be a supernova of Type Ib or Ic, caught a few days before maximum light. This particular kind of supernova is believed to result from the demise of a massive star that has somehow lost its entire hydrogen envelope, probably as a result of mass transfer in a binary system, before exploding. Also visible on the image is the trail left by a satellite, which passed by during one of the exposures taken in the B filter, hence its blue colour. This is an illustration that even in such a remote place as the Paranal Observatory in the Atacama desert, astronomers are not completely sheltered from light pollution. The second galaxy imaged by the VLT (below) is another spiral, the beautiful multi-armed NGC 7424 that is seen almost directly face-on. Located at a distance of roughly 40 million light-years in the constellation Grus (the Crane), this galaxy was discovered by Sir John Herschel while observing at the Cape of Good Hope. 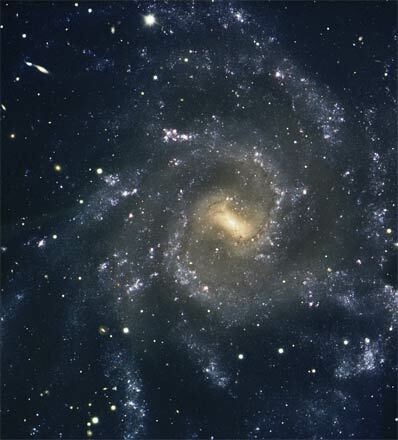 This other example of a "grand design" galaxy is classified as "SAB(rs)cd", meaning that it is intermediate between normal spirals (SA) and strongly barred galaxies (SB) and that it has rather open arms with a small central region. It also shows many ionised regions as well as clusters of young and massive stars. Ten young massive star clusters can be identified whose size span the range from 1 to 200 light-years. The galaxy itself is roughly 100,000 light-years across, that is, quite similar in size to our own Milky Way galaxy. Because of its low surface brightness, this galaxy also demands dark skies and a clear night to be observed in this impressive detail. When viewed in a small telescope, it appears as a large elliptical haze with no trace of the many beautiful filamentary arms with a multitude of branches revealed in this striking VLT image. Note also the very bright and prominent bar in the middle. On the evening of 10 December 2001, Australian amateur astronomer Reverend Robert Evans, observing from his backyard in the Blue Mountains west of Sydney, discovered with his 30cm telescope his 39th supernova, Supernova 2001ig in the outskirts of NGC 7424. Of magnitude 14.5 (that is, 3000 times fainter than the faintest star that can be seen with the unaided eye), this supernova brightened quickly by a factor 8 to magnitude 12.3. A few months later, it had faded to an insignificant object below 17th magnitude. By comparison, the entire galaxy is of magnitude 11: at the time of its maximum, the supernova was thus only three times fainter than the whole galaxy. It must have been a splendid firework indeed! By digging into the vast Science Archive of the ESO Very Large Telescope, it was possible to find an image of NGC 7424 taken on June 16, 2002 by Massimo Turatto (Observatorio di Padova-INAF, Italy) with the FORS 2 instrument on Yepun (UT4). Although, the supernova was already much fainter than at its maximum 6 months earlier, it is still very well visible on this image. Spectra taken with ESO's 3.6-m telescope at La Silla over the months following the explosion showed the object to evolve to a Type Ib/c supernova. By October 2002, the transition to a Type Ib/c supernova was complete. It is now believed that this supernova arose from the explosion of a very massive star, a so-called Wolf-Rayet star, which together with a massive hot companion belonged to a very close binary system in which the two stars orbited each other once every 100 days or so. Future detailed observations may reveal the presence of the companion star that survived this explosion but which is now doomed to explode as another supernova in due time.